happiness. Why does this work? 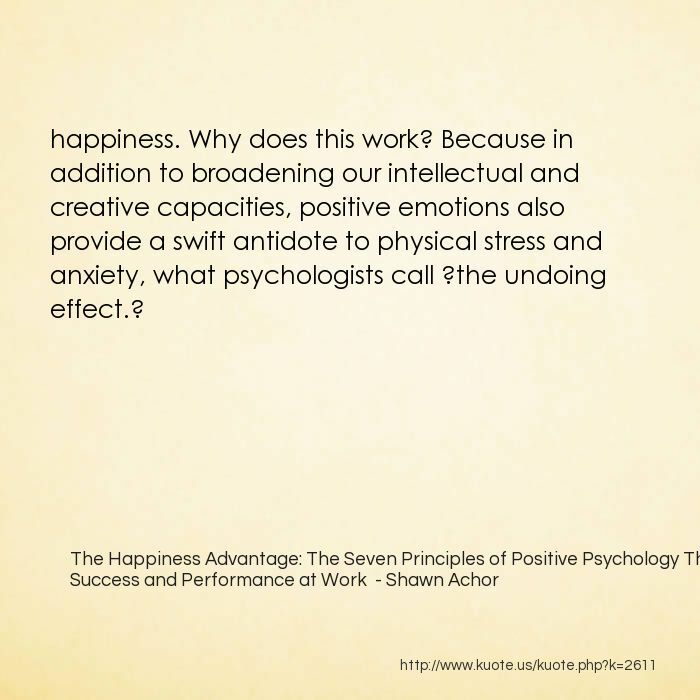 Because in addition to broadening our intellectual and creative capacities, positive emotions also provide a swift antidote to physical stress and anxiety, what psychologists call ?the undoing effect.? 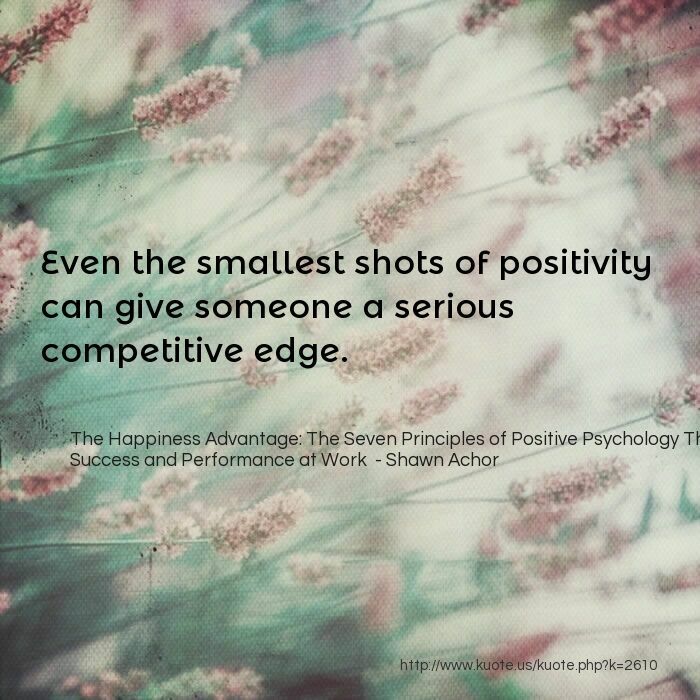 Even the smallest shots of positivity can give someone a serious competitive edge. 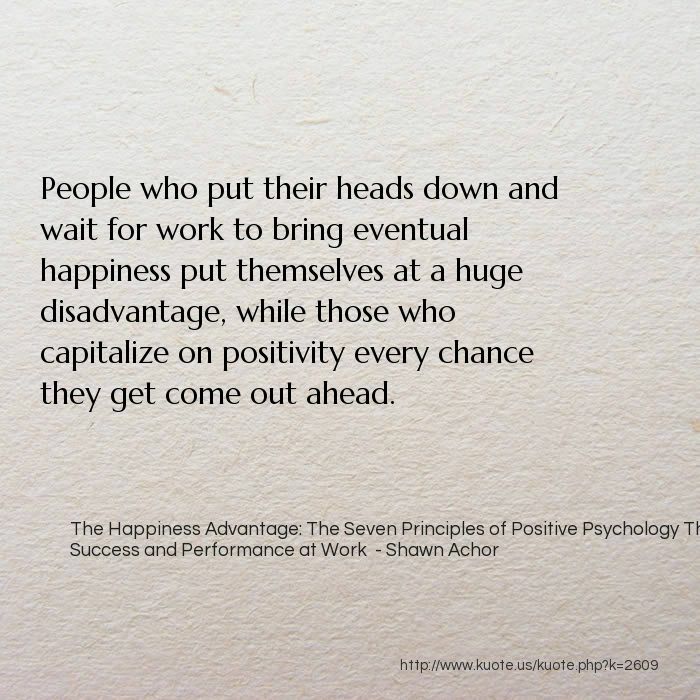 People who put their heads down and wait for work to bring eventual happiness put themselves at a huge disadvantage, while those who capitalize on positivity every chance they get come out ahead. 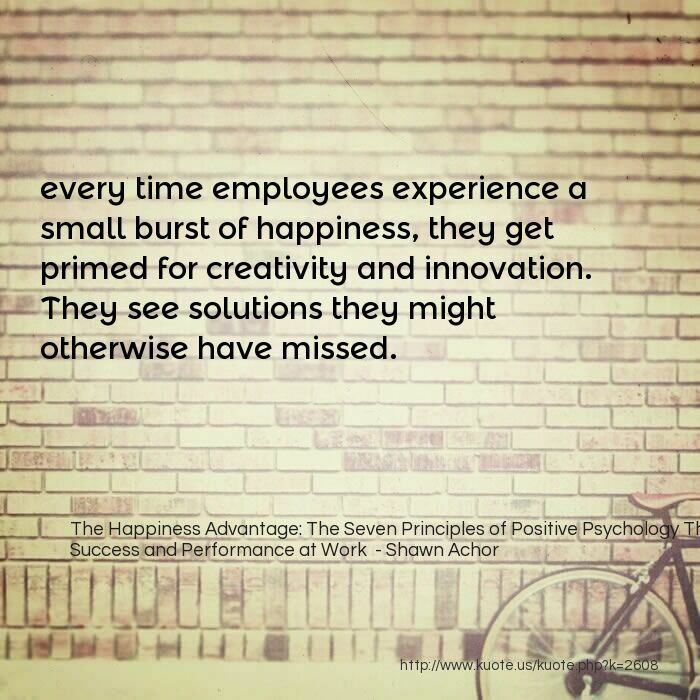 every time employees experience a small burst of happiness, they get primed for creativity and innovation. They see solutions they might otherwise have missed. Recent research shows that this ?broadening effect? 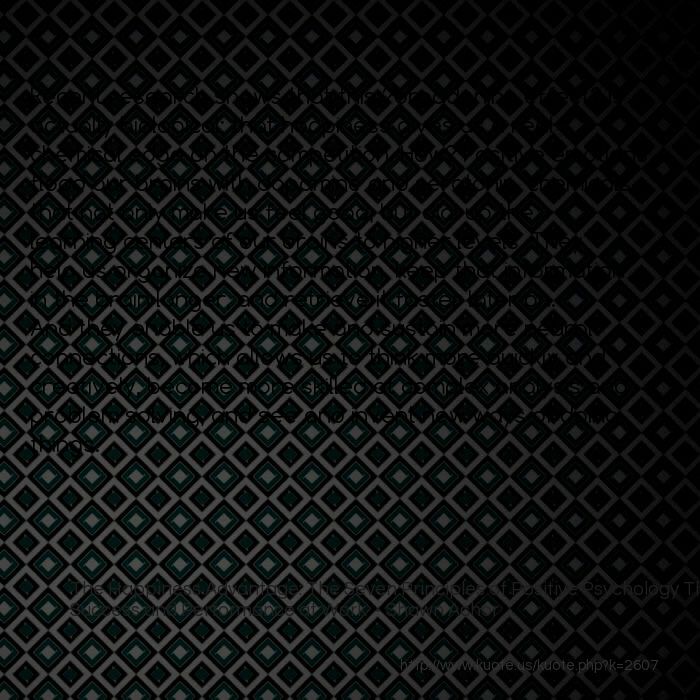 is actually biological; that happiness gives us a real chemical edge on the competition. How? Positive emotions flood our brains with dopamine and serotonin, chemicals that not only make us feel good, but dial up the learning centers of our brains to higher levels. They help us organize new information, keep that information in the brain longer, and retrieve it faster later on. 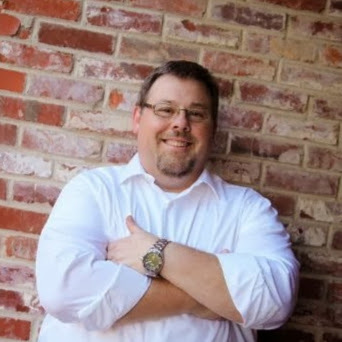 And they enable us to make and sustain more neural connections, which allows us to think more quickly and creatively, become more skilled at complex analysis and problem solving, and see and invent new ways of doing things. 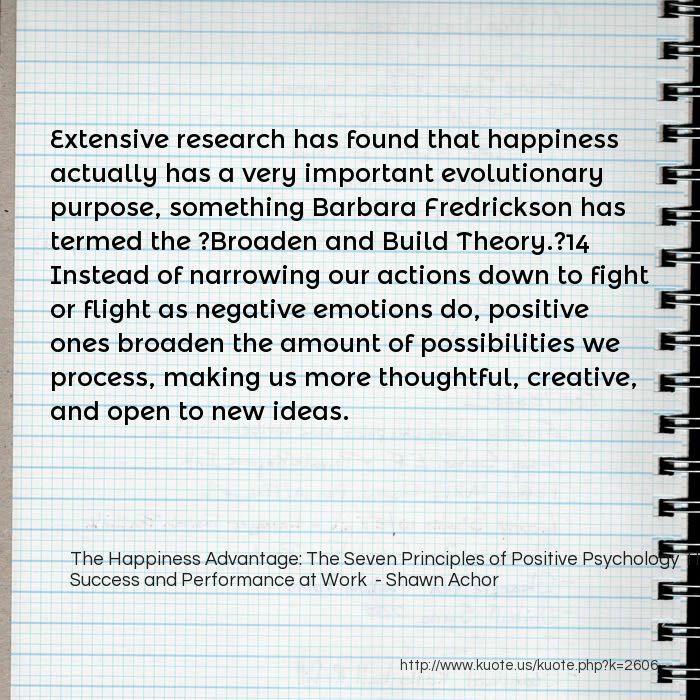 Extensive research has found that happiness actually has a very important evolutionary purpose, something Barbara Fredrickson has termed the ?Broaden and Build Theory. ?14 Instead of narrowing our actions down to fight or flight as negative emotions do, positive ones broaden the amount of possibilities we process, making us more thoughtful, creative, and open to new ideas. 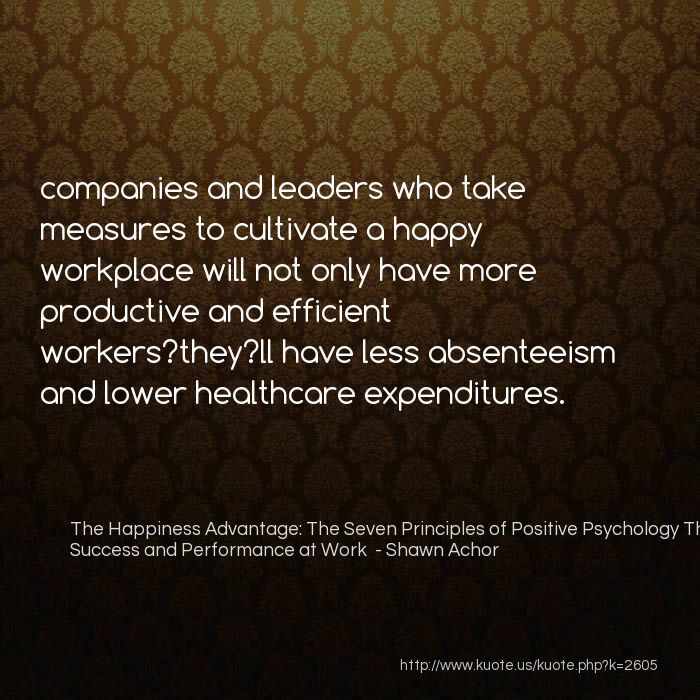 companies and leaders who take measures to cultivate a happy workplace will not only have more productive and efficient workers?they?ll have less absenteeism and lower healthcare expenditures. 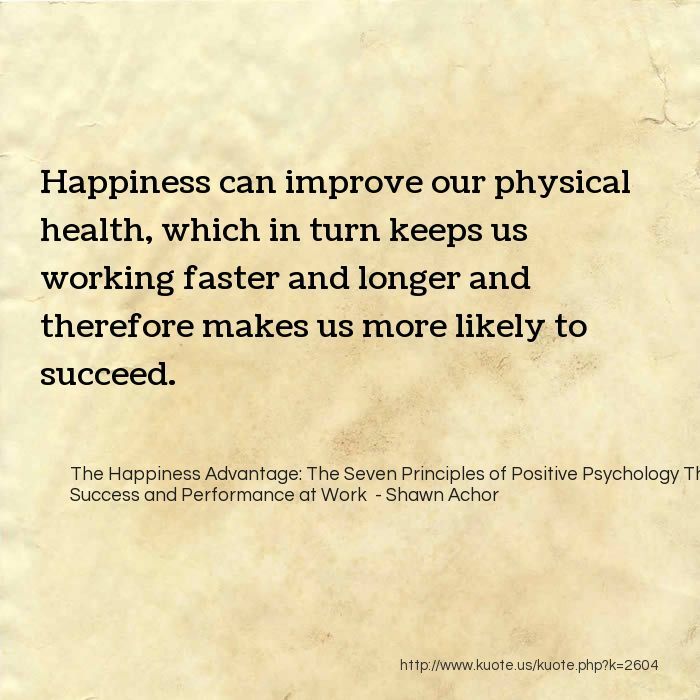 Happiness can improve our physical health, which in turn keeps us working faster and longer and therefore makes us more likely to succeed. 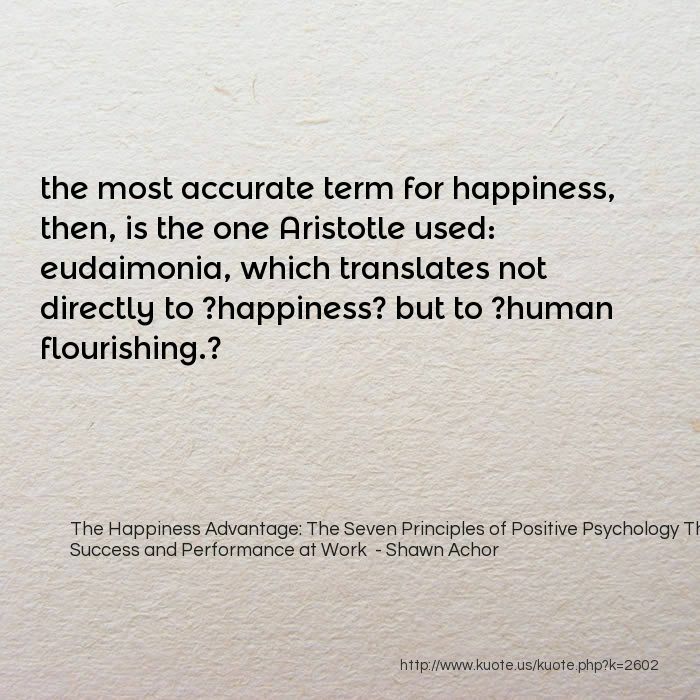 the most accurate term for happiness, then, is the one Aristotle used: eudaimonia, which translates not directly to ?happiness? but to ?human flourishing.? 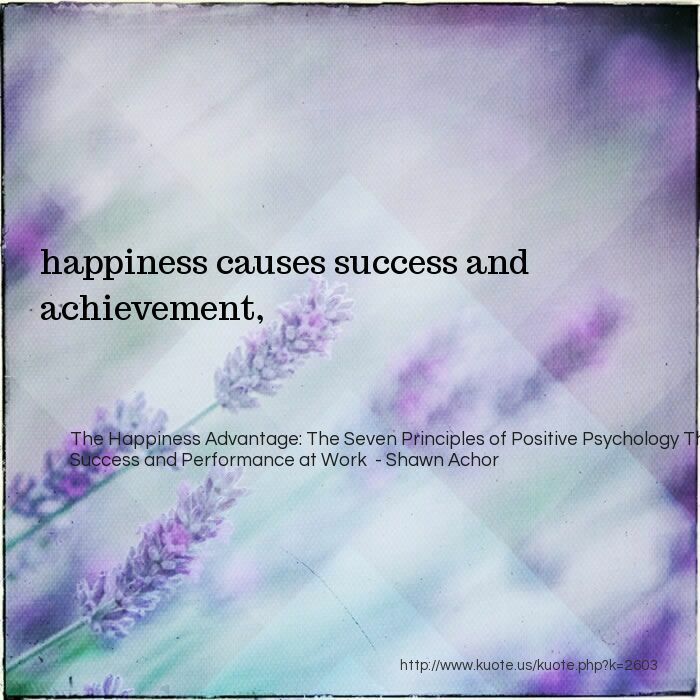 happiness is relative to the person experiencing it. 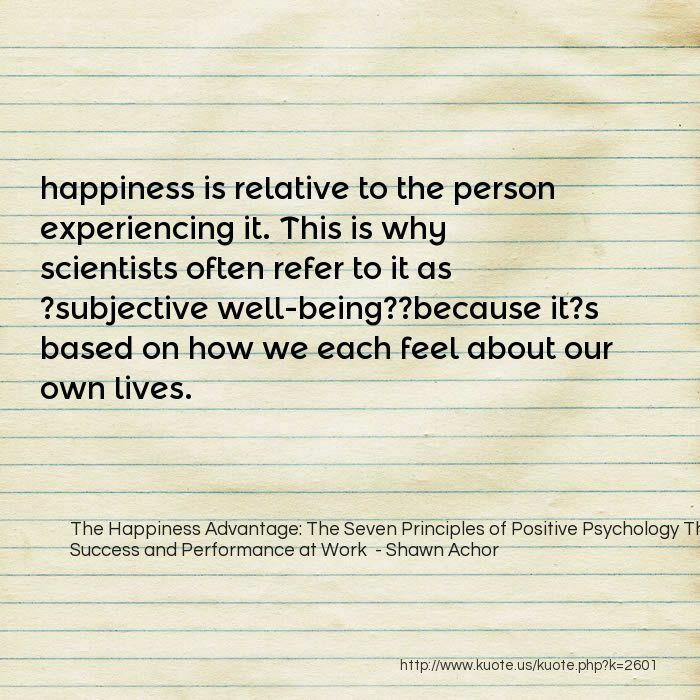 This is why scientists often refer to it as ?subjective well-being? ?because it?s based on how we each feel about our own lives. 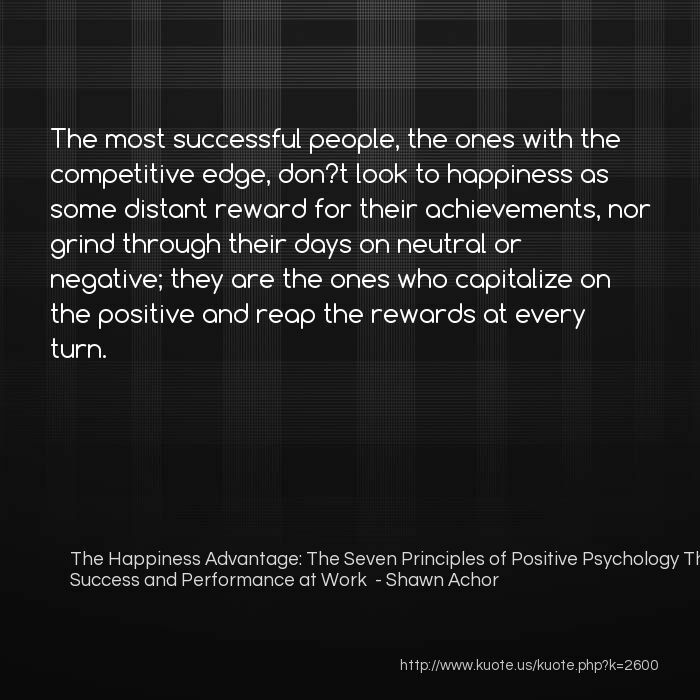 The most successful people, the ones with the competitive edge, don?t look to happiness as some distant reward for their achievements, nor grind through their days on neutral or negative; they are the ones who capitalize on the positive and reap the rewards at every turn. despite the decades of research that tell us otherwise, many businesses and their leaders still cling stubbornly to their belief in this flawed order. 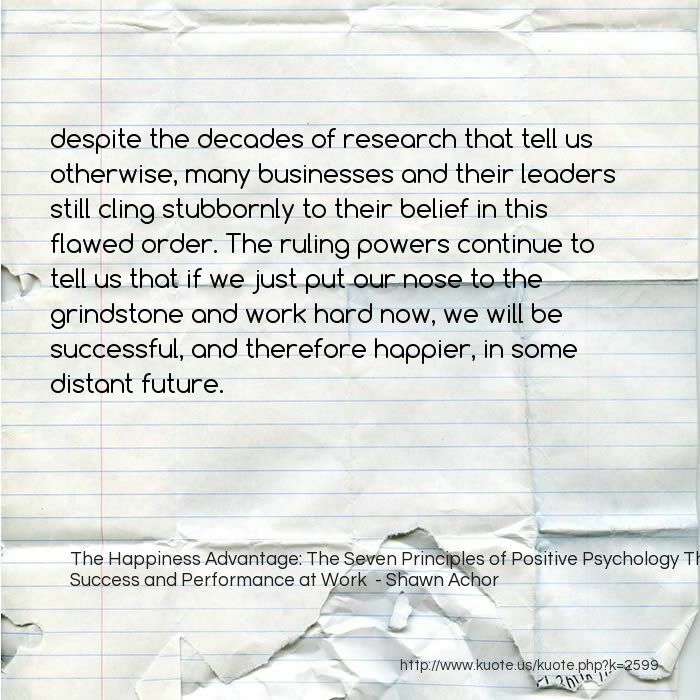 The ruling powers continue to tell us that if we just put our nose to the grindstone and work hard now, we will be successful, and therefore happier, in some distant future. 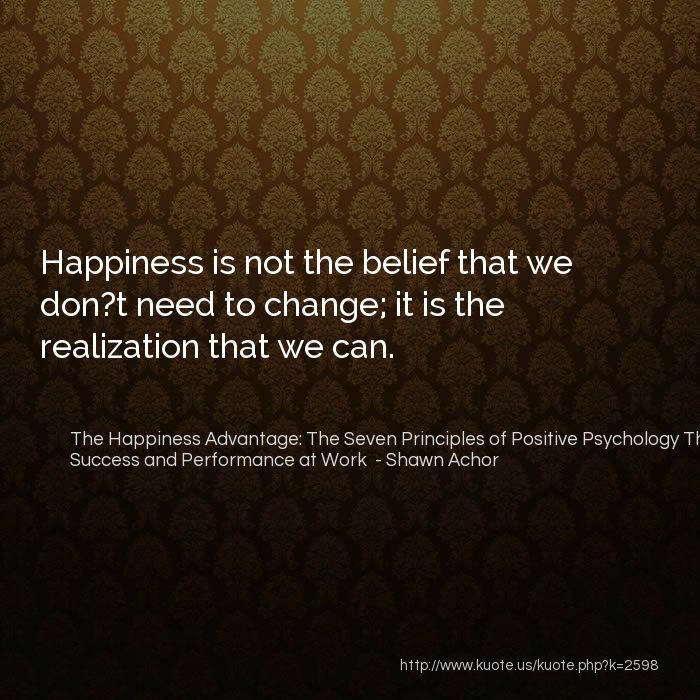 Happiness is not the belief that we don?t need to change; it is the realization that we can. 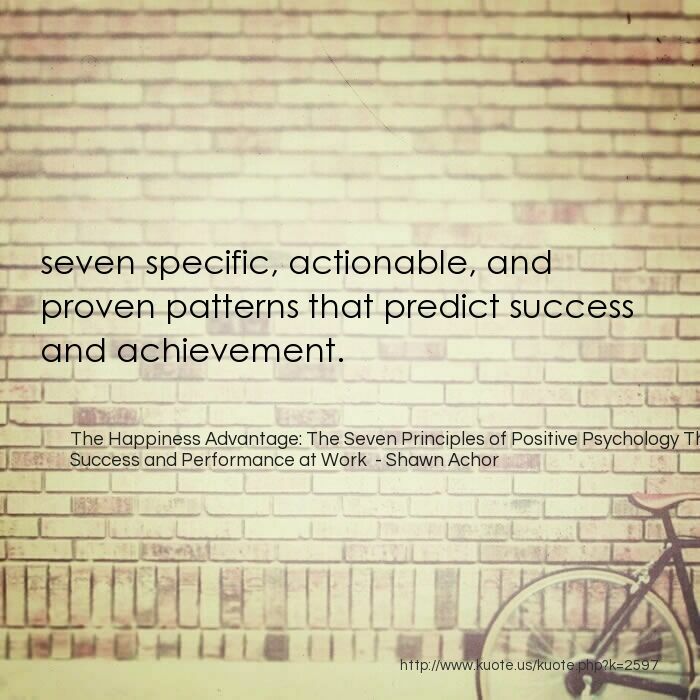 seven specific, actionable, and proven patterns that predict success and achievement. 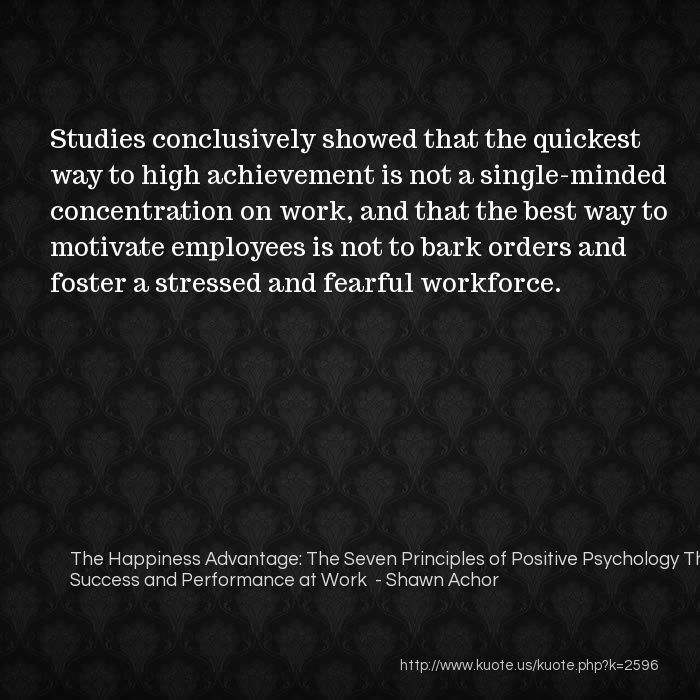 Studies conclusively showed that the quickest way to high achievement is not a single-minded concentration on work, and that the best way to motivate employees is not to bark orders and foster a stressed and fearful workforce. 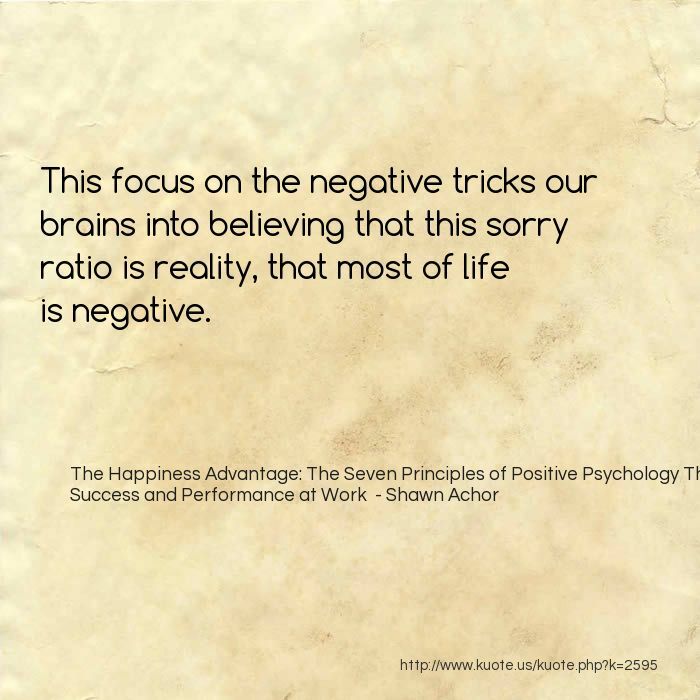 This focus on the negative tricks our brains into believing that this sorry ratio is reality, that most of life is negative. 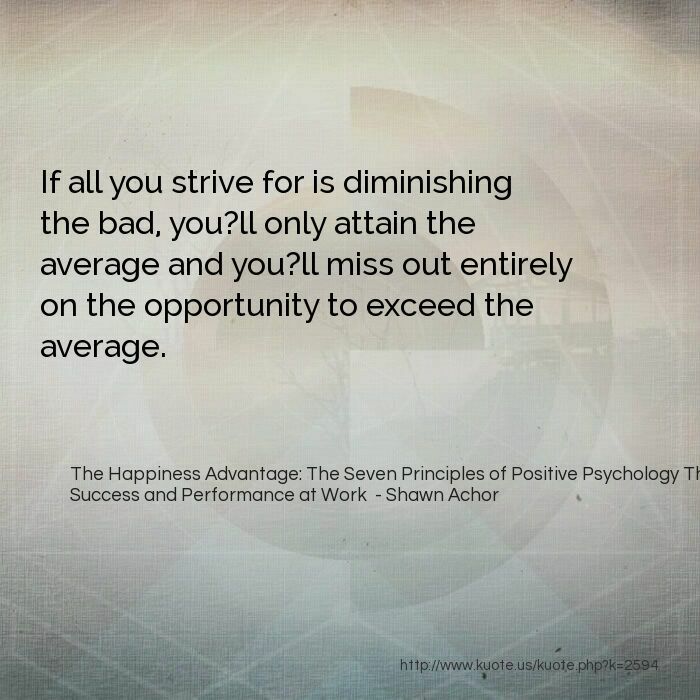 If all you strive for is diminishing the bad, you?ll only attain the average and you?ll miss out entirely on the opportunity to exceed the average. 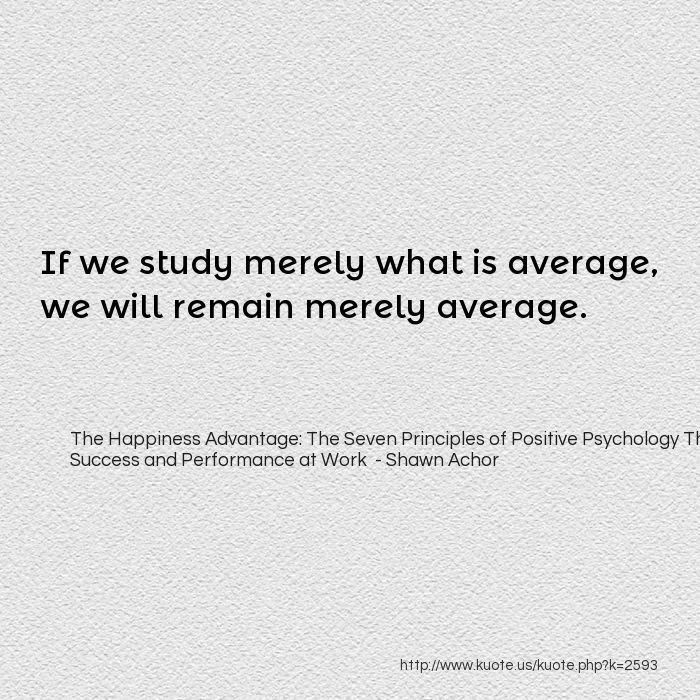 If we study merely what is average, we will remain merely average. 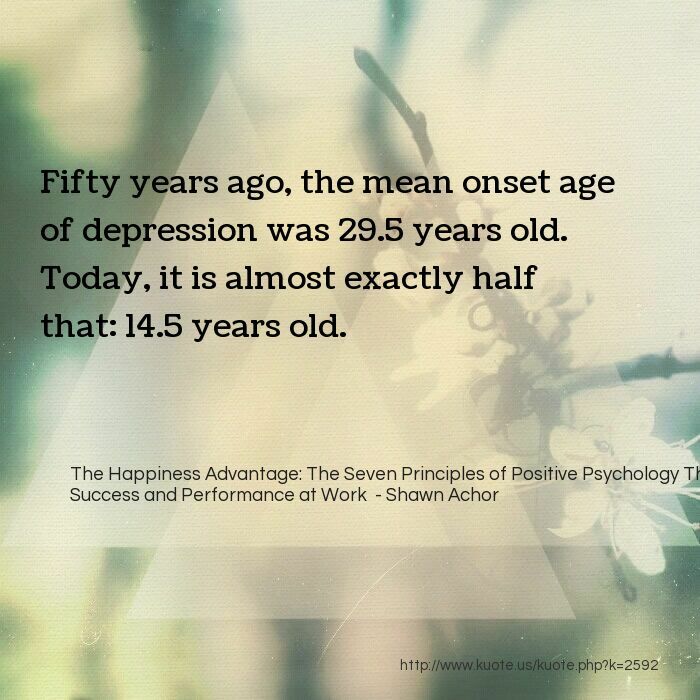 Fifty years ago, the mean onset age of depression was 29.5 years old. Today, it is almost exactly half that: 14.5 years old.